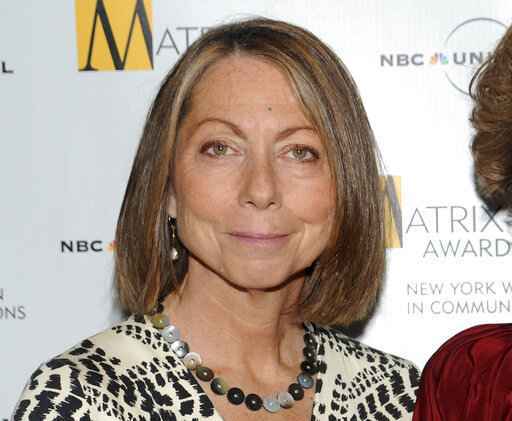 NEW YORK (AP) — Former New York Times executive editor Jill Abramson is facing allegations that she lifted material from other sources for her new book, "Merchants of Truth." Abramson and her publisher are promising to investigate. A Twitter thread posted Wednesday by Vice correspondent Michael Moynihan lists several examples of passages in "Merchants of Truth: The Business of News and the Fight for Facts" that closely resemble material in The New Yorker, Time Out and other publications. Released this week and praised by Walter Isaacson and Gay Talese among others, "Merchants of Truth" is a critique of the news business focused on two long-running newspapers, the Times and the Washington Post, along with Vice and fellow digital company BuzzFeed. "I take seriously the issues raised and will review the passages in question," Abramson tweeted Wednesday night. "I endeavored to accurately and properly give attribution to the hundreds of sources that were part of my research." She has previously been criticized for alleged factual errors, with reporters at Vice and PBS among those faulting her. On Wednesday, she responded that some criticisms arose from Vice's unhappiness with "Merchants of Truth" and its portrait of hypocrisy and sexism. Abramson tweeted that her book offered "a balanced portrayal." In a separate statement, Simon & Schuster wrote that Abramson's book had given "an extraordinary degree of transparency toward its subjects; each of the four news organizations covered in the book was given ample time and opportunity to comment on the content, and where appropriate the author made changes and corrections. If upon further examination changes or attributions are deemed necessary we stand ready to work with the author in making those revisions." Appearing Wednesday night on Fox News, Abramson disputed the allegations, saying: "All I can tell you is I certainly didn't plagiarize in my book and there's 70 pages of footnotes showing where I got the information." Writers are generally expected to credit their sources directly in the body of the text if the material is similar. For her book, Abramson was assisted by John Stillman, whom she credits with helping her with research, reporting and writing. Stillman, a freelance journalist who has written for Gothamist and The Awl among others, declined comment when reached by telephone Wednesday night. Abramson wrote for the Times and the Wall Street Journal among others before becoming the Times' first female executive editor in 2011, one of journalism's most prestigious and influential positions. She was fired three years later after frequently clashing with fellow staff members, and currently teaches creative writing at Harvard University. Her previous works include "Strange Justice," a book about Supreme Court Justice Clarence Thomas that was co-written by Jane Mayer.